More so than usual, this week’s council by-elections were overshadowed by events elsewhere. In their own humble way they had a few interesting stories to tell, however. Labour was the victor in all three contests. Two were holds; one was a gain. 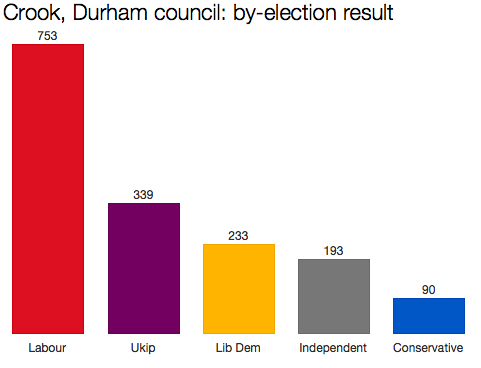 Labour now holds almost 100 of Durham county council’s 126 seats. While the party fought off all challenges in Thursday’s other two by-elections, in both cases there was a swing to somebody else. In the Quarry and Risinghurst ward of Labour-run Oxford city council, there was a swing of 4.5% from Labour to the Liberal Democrats, who improved their second place performance ahead of the Tories, the Greens and the English Democrats. Ukip did not field a candidate. Conwy is one of the few councils in the country governed by a genuine “rainbow” coalition: Labour, Plaid Cymru, the Liberal Democrats and assorted independents. The only party not in power is the Conservatives.